In the design case of the Alice table lamp, the variation in scale takes the form of a subtle reworking of the relationship between function, form, material and proportions. 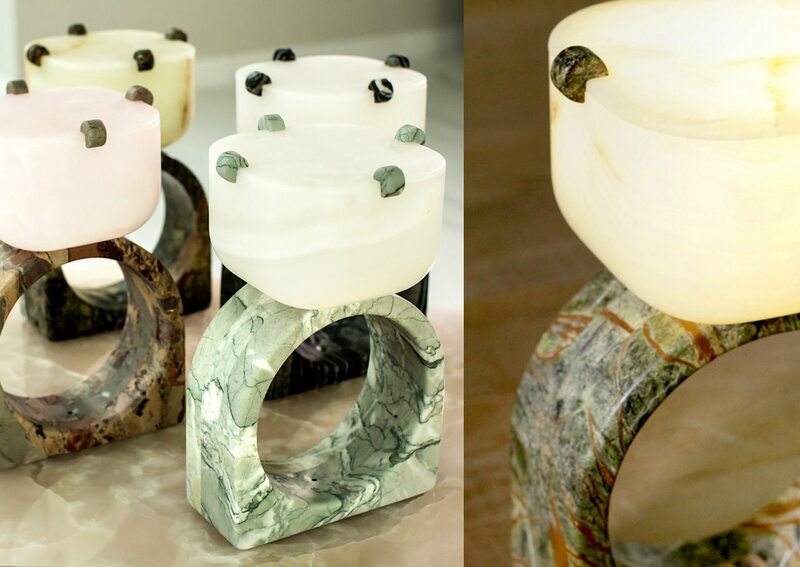 At first glance, the lamp looks like a ring with an extra-large stone gem: an oversize item of table jewellery, its proportions correct but unexpectedly produced in shaped marble. The base of the “Alice” lamp is available in different types of marble: Blackwood, a material with black streaks, Serracolene Versailles, an exquisite French material named after the Palace of Versailles, Rain Forest Green, an Indian material in shades of green, and Verde Antigua, a white marble with pale green vein patterning. The “gems” are all in onyx, in pastel shades.